When Cash Is King Stable, co-owners of the brilliant two-year-old filly Jaywalk with DJ Stable, won the Breeders’ Cup Juvenile Filly, it wasn’t the stable’s first time in the national spotlight. Cash Is King’s initial success was almost immediate thanks to managing partner Chuck Zacney. Founder of Sirrus Group—a regional medical billing company based in Norristown, Pennsylvania, Zacney grew up near Liberty Bell and Keystone racetracks and fell in love with racing at a young age. His friend Joe Lerro approached him at the 2004 Super Bowl about buying a Thoroughbred. He did. One of their first horses was Afleet Alex, who finished second in the 2004 Breeders’ Cup Juvenile. Afleet Alex’s success as a three-year-old in 2005 took on a whole new level thanks to the brave little girl, Alex Scott, who in 2000, at the age of four while suffering neuroblastoma (a rare form of childhood cancer), created Alex’s Lemonade Stand in her home town in Manchester, Connecticut, to raise awareness and money to fight the pediatric cancer she was battling and to help find a cure for all children with cancer. She opened her first stand on her front lawn and raised $2,000 that day. 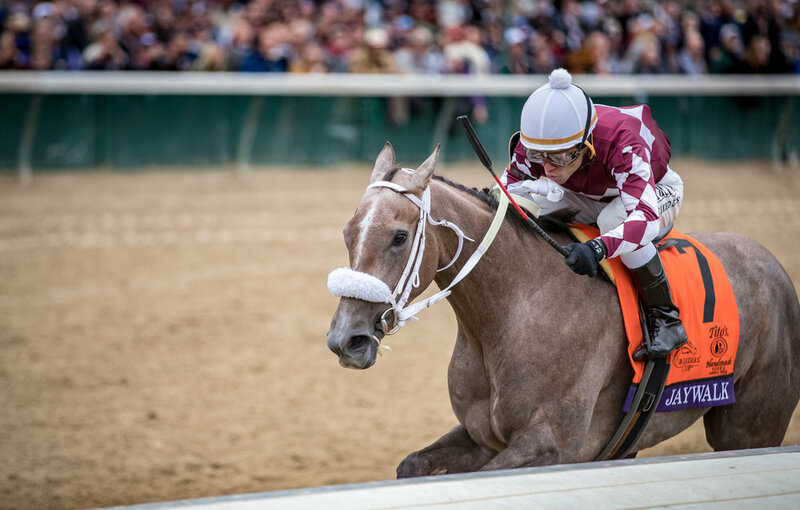 Alex, of course, fell in love with Afleet Alex, and his connections brought her family to all three Triple Crown races and the connections became major contributors, helping to raise $4 million in 2005 as Alex’s Lemonade Stands popped up all over the country. Afleet Alex nearly won the Triple Crown in 2005. Afleet Alex led in deep stretch before finishing third by one length to Giacomo in the Kentucky Derby. Afleet Alex romped in the Belmont Stakes by seven lengths, but then was injured and retired to stud. To date, Alex’s Lemonade Stand Foundation has raised more than $150 million to fight childhood cancer and funded nearly 1,000 research projects nationally—a mission which might not have prospered if Afleet Alex hadn’t distinguished himself in the Triple Crown. “I will never be able to thank that horse enough for what he did for the Foundation and for our family,” said Jay Scott, Alex’s dad and co-executive director of the Foundation. Cash Is King was awarded a Special Eclipse Award in 2005 for their work with the lemonade stands and with Alex’s ongoing battle, which she unfortunately lost in August, 2004. Cash Is King didn’t have another Breeders’ Cup starter until 2018 when Jaywalk entered the starting gate at Churchill Downs. Alex Scott would likely have fallen in love with Jaywalk, a filly who excelled and had a limitless future—one she deserved but never received. DJ Stable was founded in the early 1980s by New Jersey natives Lois and Leonard Green. DJ Stable is now managed by their son Jonathan, the “J” in DJ Stable. The “D” is for one of the daughters, Debbie, who, like another daughter, Beth, is an attorney. The stable’s top horses include Grade 1 winner Songandaprayer and 2000 Sapling Stakes winner Shooter. In addition to their racing operation, the Greens have a successful breeding operation at Hawkeye Farm in Lexington, Kentucky.